Quick Response or “QR” codes are quickly becoming a way to easily engage your market, creating a shortcut to an action you want them to take. With the ever-increasing number of smartphones in our consumers’ hands, the faster and more easily we can get information into their hands, the more likely they are to use it and act on it. As barcodes evolved, the desire to use them to store increasing amounts of information also evolved. Standard barcodes are limited to horizontal data storage. Several attempts were made to try to include more information, but these attempts resulted in oversized or multiple barcodes, which lead to scanning and printing errors. QR codes are two-dimensional square barcodes with the ability to encode information both vertically AND horizontally. This allows users to store much more information in a small space. For example, if you wanted a barcode for http://www.mywebsite.com, a standard barcode would need to be about 200 pixels wide. A QR code could easily be half that size, and contain your entire contact card or code for the scanner to “Like” your Facebook page. It’s easy! 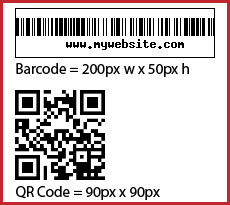 Check out a site such as www.qrstuff.com, select the type of QR code you want to generate (i.e. web link, social networking, vCard, etc;), enter your content and download your QR code. Pass the code on to your design team to incorporate wherever possible. How can QR codes be integrated into a marketing plan? Direct link to purchase or additional information – Put a QR code on your flyers that links directly to a site where they can purchase the product advertised or get more information about the product or service. Easy download of contact info – If you’ve ever had a stack of business cards from potential clients after a trade show, one of the last things you want to do is have to enter all that information into your database. By placing a vCard QR card on your business card, clients can download all your contact information in one scan. That beats even using a business card scanner! Try putting a vCard QR code wherever you put your contact information, on your business cards, website or even on a company vehicle! Social networking – According to Facebook statistics, there are more than 500 million active Facebook users worldwide, so getting your business out there on Facebook can help you gain massive worldwide exposure. The more “Likes” you get on your Facebook page, the more exposure you will get. So QR codes encouraging clients to “Like” your Facebook page is an easy way to gain exposure. Map location – If you are encouraging customers to go to a location, include a QR code with a Google Maps location so they can easily find your location. Promotional Products – Put a QR code on promotional/giveaway products to allow your customers to order products, visit your website or email you. The easier you make it for customers to reach you, the more likely they will be to be repeat customers. Informative videos – Enhance your customers’ knowledge about your product or service by linking a QR code to a YouTube video demonstrating your product or service in action, testimonials or a commercial. Event reminders – Are you planning a grand opening or sale? Link a QR code to a calendar reminder! It never hurts to put a short explanation of what the QR code is for, especially if it does more than just take the viewer to a website. Just a short blurb such as “scan this code with your smartphone to Like us on Facebook” or “use this code to add my vCard to your smartphone” can increase your client’s likelihood of scanning your QR code because they will know exactly what action they will be taking when scanning the code. QR codes are excellent tools, but overuse can be annoying especially to those without smartphones. Try limiting your use to just 1 QR code per document or web page. If you really want to serve multiple purposes with a QR code, direct the QR code to a landing page where viewers can select the action(s) they want to take. You could offer options such as information links, email sign-up, download your contact information or a link to a social networking site. When saving QR code files, it’s really helpful to include the code’s purpose in the file name. For example, you would know qr.emailsally.jpg is a QR code to email Sally or qr.facebooklike.jpg leads to a “Like” on Facebook. This way you are less likely to confuse your codes. These are just a few of the ways QR codes can be integrated into marketing. How do you currently or plan to use QR codes? Scan this code with your smartphone to email me! I’m uzing the same blog platform as yours and I’m having trouble finding one?